Streamcraft is a term that we helped to popularise in this country and it was one of the first services that we offered back when we started up in 1994. A streamcraft session is for people who can cast but who are not consistently catching fish, or for people who just want to improve their skill-set further. As expert river anglers and instructors, we will quickly identify and correct any problem areas you may have, and set you on the road to catching fish on your own consistently. Let us assist you in being the best fly fisher you can be. Streamcraft is the name used to describe the collective skill-set required to find, fool and catch trout in running water. All of our instructors are ‘mad’ about river fishing and have spent a considerable part of their lives chasing trout in streams. This is perhaps the first thing we would recommend that you find out when choosing someone to instruct you in streamcraft. 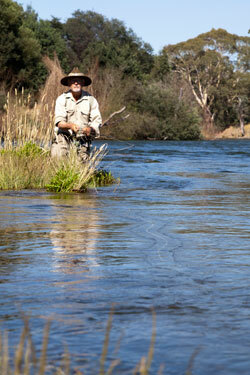 Do the instructors fish/guide on rivers on a daily basis? We chose Thornton as our base back in 1994 because it has two of the best rivers in Victoria within a few minutes of each other. 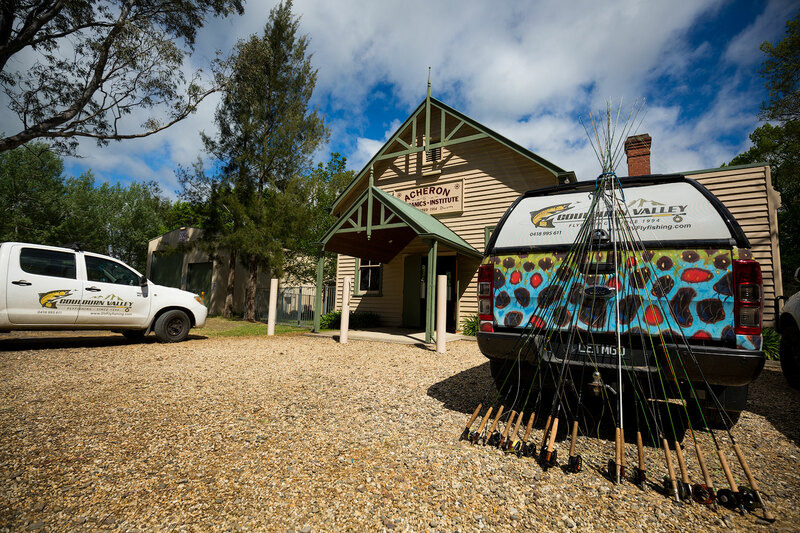 The Goulburn and Rubicon Rivers are very different and offer every situation you are likely to encounter while trout fishing, both here and around the world. From the small stream Rubicon River with it’s classic pool, riffle, run structure, to the majestic Goulburn River tailwater with its 70 metre wide gravel bars and terrific hatch based fishing. These two rivers are polar opposites and therefore complementary, when utilised to instruct our clients in the art of streamcraft. Streamcraft lessons typically involve time on both rivers, allowing us to teach both small and large stream skill-sets. This can be modified as per the clients individual needs or the conditions at the time. A full day’s streamcraft instruction may include time on both rivers or multiple sessions on different sections of one of them. All of our guides are passionate river fishermen who have each taught thousands of fly fishers the art of streamcraft over the past twenty plus years. We leave no stone unturned (entomological pun intended) in helping you to develop your skills. These are just some of the many things that our instructors will cover in any given session. All of our staff are full time fly fishing instructors with a knack for imparting information and skills that have taken many decades to attain. A half or full day streamcraft session is perhaps the single most important thing that the beginner/intermediate fly fisher can do to make the next jump in level to consistently catching fish. In the space of a single session, we will get you understanding the key concepts and capable of independent progress; cutting many years from the learning process and increasing your enjoyment of fly fishing in the process. * Full day – 8 hours —— $550 1 angler, $590 2 anglers – includes sandwich lunch. Please view our current prices by clicking here or phone us on 03 5773 2513 or 0418 995 611 for more information. We are available on the phone from 8am – 10pm, every day of the year.